CGS Intake Systems are engineered specific to each application to ensure a perfect fit. CGS Intake Systems aren't just ejected from a plastic mold; they are handcrafted and sculptured from steel, into virtually an art form. CGS Intakes give you the best of both worlds, your not only gaining horsepower, but you are getting better gas mileage. Our systems add 1-2 miles per gallon, as well as up to 18 horsepower. The tubing is CNC mandrel bent and powder coated to provide style and durability. CGS Intakes offer superior filtration and maximum air flow. CGS filters are washable and reusable to give you control of the air your engine breathes. 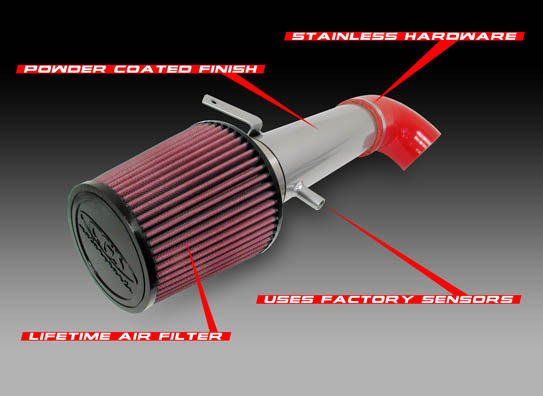 These top-of-the-line intake systems offer easy bolt-on installation and a complete replacement lifetime warranty, at an unbeatable price. The simple installation requires no modifications, and most applications are 50 state street legal.